I hate keeping secrets from my wife. But I’ve become very good at it. So when my mind was made up to surprise Amanda with a diving trip in the Bahamas, it was just a matter of saving the right amount of money so she didn’t notice a $300 check being cleared and avoiding making any other plans for the day I had booked. The last part there was harder than it sounded, as Amanda asked me for two months if I’d found a sailing trip I wanted to go on. But I kept it quiet, so much so even after the shuttle from Stuart Cove Dive Center, 25 minutes from Nassau, picked us up and we checked in, she still wasn’t 100% sure. The plan apparently was so secret the dive company didn’t even know. You see, after we checked in we were directed to a boat with several other couples. The boat had tanks, fins, dive masks, snorkels and several crew members — everything we needed. We pushed off and powered our way off the coast toward a reef known as the Hollywood Bowl. The captain gave us a little talk about safety and our itinerary, then separated our groups. We had one guy who was getting certified in rescue diving, a couple doing SNUBA — like SCUBA but tethered to an air line — and one couple of snorkelers. I felt something wasn’t right when we were directed to a boat and not the pool. You see, beginner dive lessons always start in a pool. So as everyone was getting in the water, I talked to the captain. I had held on to the paperwork (just in case) and yep, we were on the wrong boat. It took a little time, but we got everything sorted out. The company would send our instructor out to us and we would do our first dive lesson in the open water. The sensation of breathing under water is not natural. The moment I put on the equipment and took the plunge I felt what I think is a natural reaction: anxiety. We began our basic lesson in the front of the boat, holding on to the tether line and using that to help us descend. My heart was racing out of control, but my mind was the key. I knew that I was fine, that I just needed to breathe normally. So I closed my eyes as our instructor worked with Amanda and concentrated on my breath, in-out, in-out, in-out. After we descended, regulating the pressure in our ears every couple of feet, we showed our instructor we could perform a couple of key safety-related moves. We let a little bit of water into our masks and cleared it, and tossed our regulators over our shoulders (yeah, that was unnerving), and blowing little bubbles as we brought them back in front of us, getting them back into our mouths and purging the saltwater. Neither of us nailed all of the skills on the first try (anyone who’s met me won’t be shocked that I lack some coordination skills), but we got there. Then it was time to explore the beautiful blue water. 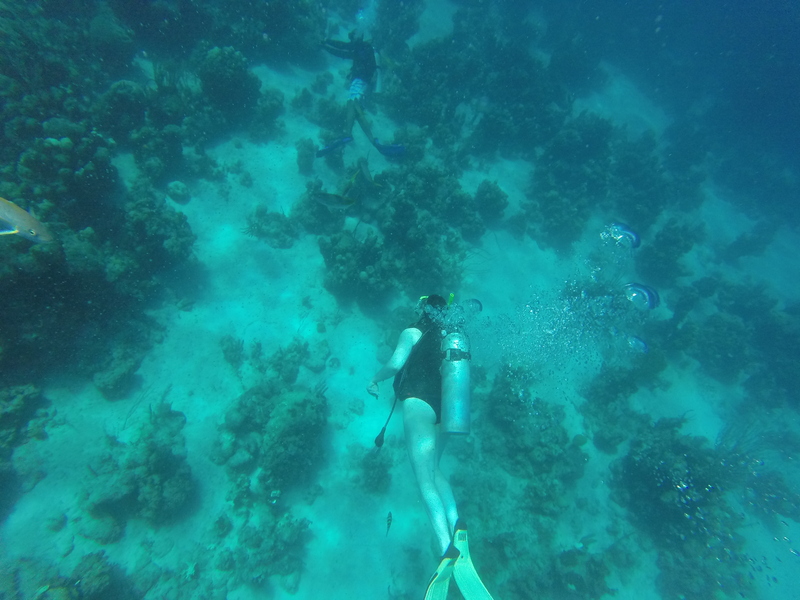 We followed our guide, swimming through schools of fish and checking out the intricate coral growth. We’ve been snorkeling many times — and loved it — but the ability to swim with the fish rather than over them was incredible. Zeke surprised me, all right. He’s full of surprises. And through nine years of marriage I’ve loved every one of them.